Citation Information: J Clin Invest. 2005;115(11):2992-3006. https://doi.org/10.1172/JCI24586. The molecular and cellular pathways that support the maintenance and stability of tumor neovessels are not well defined. The efficacy of microtubule-disrupting agents, such as combretastatin A4 phosphate (CA4P), in inducing rapid regression of specific subsets of tumor neovessels has opened up new avenues of research to identify factors that support tumor neoangiogenesis. 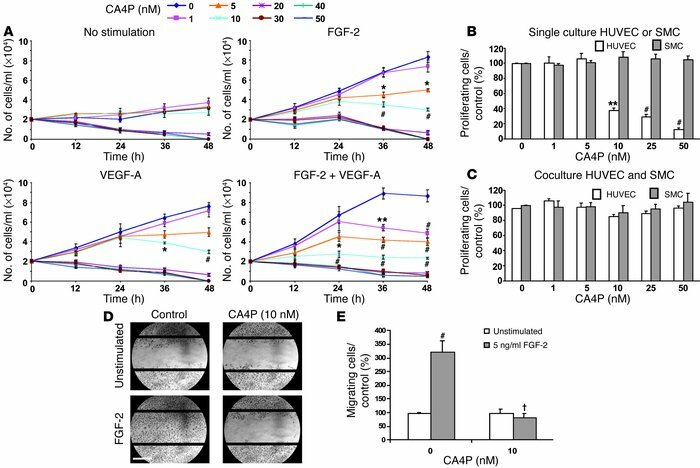 Herein, we show that CA4P selectively targeted endothelial cells, but not smooth muscle cells, and induced regression of unstable nascent tumor neovessels by rapidly disrupting the molecular engagement of the endothelial cell–specific junctional molecule vascular endothelial-cadherin (VE-cadherin) in vitro and in vivo in mice. CA4P increases endothelial cell permeability, while inhibiting endothelial cell migration and capillary tube formation predominantly through disruption of VE-cadherin/β-catenin/Akt signaling pathway, thereby leading to rapid vascular collapse and tumor necrosis. Remarkably, stabilization of VE-cadherin signaling in endothelial cells with adenovirus E4 gene or ensheathment with smooth muscle cells confers resistance to CA4P. CA4P synergizes with low and nontoxic doses of neutralizing mAbs to VE-cadherin by blocking assembly of neovessels, thereby inhibiting tumor growth. These data suggest that the microtubule-targeting agent CA4P selectively induces regression of unstable tumor neovessels, in part through disruption of VE-cadherin signaling. Combined treatment with anti–VE-cadherin agents in conjunction with microtubule-disrupting agents provides a novel synergistic strategy to selectively disrupt assembly and induce regression of nascent tumor neovessels, with minimal toxicity and without affecting normal stabilized vasculature. CA4P inhibits growth factor–induced endothelial cell proliferation and migration. (A) CA4P inhibits HUVEC proliferation. HUVECs were incubated with or without growth factors, and CA4P was added at different concentrations. Cells were then counted at the indicated time points. Results of 4 experiments in duplicate are expressed as the mean number of cells ± SEM (*P < 0.05, **P < 0.01, #P < 0.001 compared with CA4P-untreated cells; n = 4). (B) SMCs are not sensitive to CA4P. HUVECs or SMCs were incubated with CA4P, and cells were counted after 48 hours. Results of 4 experiments in duplicate are expressed as the mean number of cells ± SEM (**P < 0.01, #P < 0.001 compared with CA4P-untreated cells; n = 4). (C) HUVECs are resistant to CA4P when cocultured with SMCs. HUVECs and SMCs were seeded together, incubated with CA4P, and counted after 48 hours. Results of 4 experiments in duplicate are expressed as the mean number of cells ± SEM. (D) CA4P inhibits HUVEC migration. A lesion was produced across the HUVECs’ monolayers, and unstimulated or FGF-2–stimulated cell monolayers were incubated with CA4P for 24 hours and then photographed. A representative picture is shown. Magnification: ×4. Scale bar, 500 μm. (E) Quantification of recovery of each denuded area after CA4P treatment. Results are expressed as the ratio of the number of invading cells to the number of migrating cells in absence of CA4P ± SEM (#P < 0.001 compared with CA4P-untreated cells; †P < 0.001 compared with FGF-2–stimulated endothelial cells; n = 5).